Methods of Casting: All casting shall be executed with both hands. All casts to be made without assistance. The use of a casting aid on fixed spool reels acceptable. Reels: Any reel may be used, as long as it is possible to fish with that reel. Leader : Must be strong enough for the individual Casters ability and should be of high visibility. The Caster is responsible for his/her break-off and safety of other Casters. No braid leaders allowed. The Judge or Committee may use their discretion to allow a Competitor extra time, or casts, if justified by outside interference or other mishaps beyond the Casters control. Replacement of tackle may be made providing this can be done within the given time limit. Five (5) minutes repair time will be allowed for each cast. Random measuring of line diameter will be carried out at all events. All NZ Records will have the main line diameter measured close to join with the leader, at the mid point and at a point close to the reel end at completion of each cast. In the event of a dispute the decision of the Judge or Committee shall be final. NZ Records : NZ Records can only be set at NZACA Nationals and/or any other NZACA sanctioned event. Nationals Casting Records cannot be set at Postal, Regional or Club events. 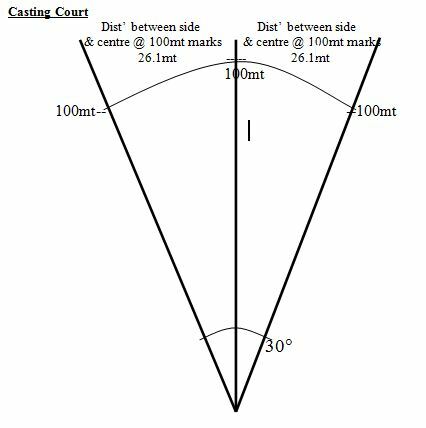 Casting: Casting shall be from behind a 2.5mt board set at 90 degrees to the centre of the court. No competitor may pass this board whilst in the action of casting or until the lead weight has landed. The line must remain unbroken after the cast has been made until the weight has come to rest. Points Scoring : Measurement of every cast will be recorded to two decimal places. One(1) point per metre for Competitors longest cast. Accuracy maximum score of forty(40) points for each cast with two(2) points deducted for each metre distance from target. Measurement is from artificial bait.